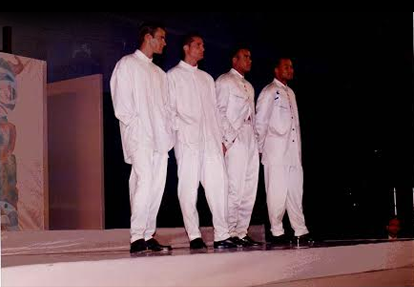 in 1992 Orville Ellis opened a retail store called " Design Zone for Men at the Queen's Terminal, Toronto. Since 1992, in addition to retailing his collection and other wearable apparel and accessories, Mr. Ellis sells to other distributors, retailers and consumers. 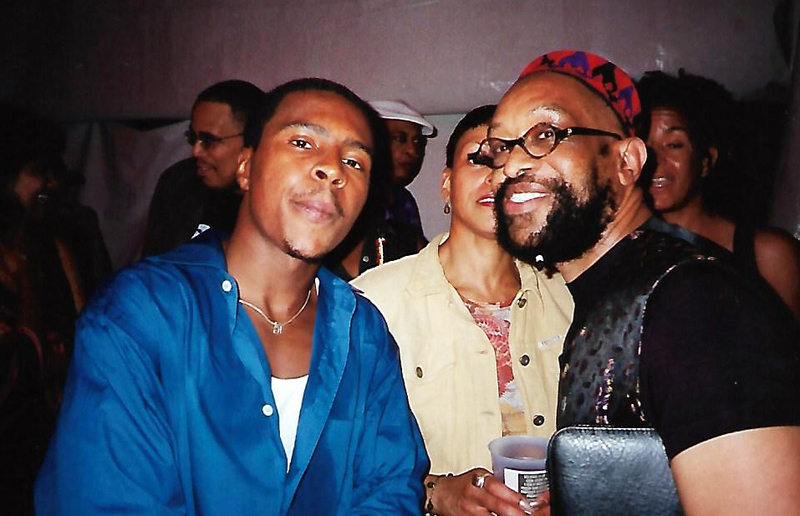 He also gotten credit on Giaht Steps move starring Billy Dee Williamc and that was the highlight of 1992 , followed with more credits on moves including Rude and Paint Cans. He was back on the Movie trail with Exit Wounds in 2001 starring Steven Seagal and DMX. 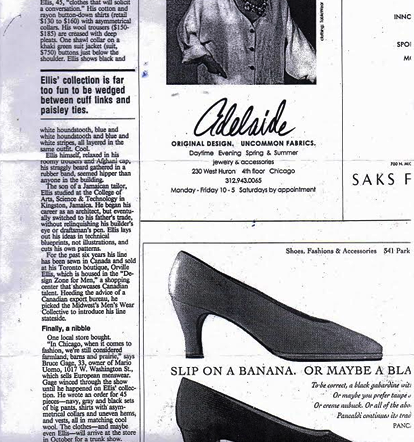 On September 08, 1996, Mr. Ellis received the " Yorkdale 1996 Design Award of Distinction" for his fall ' winter collection, as ohe of six Canada's most outstanding designers. 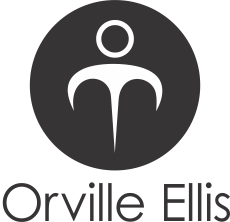 Orville Ellis is much sorted after designer for interviews. 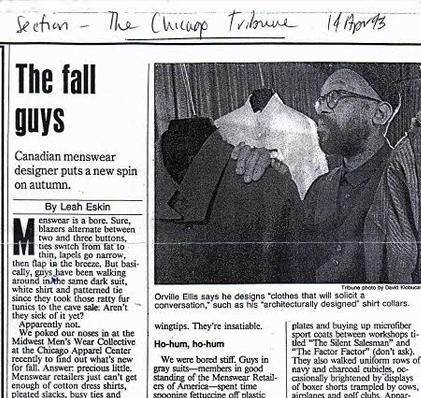 Code Magazine did a great piece on him in the year 2000 and, in the year 1995 The Chicago Tribune interviewed him at the Chicago Men's Wear collection in Chicago, Illinois. From the time he was ten years old, Orville Ellis interest in fashion design, an interest inherited from his father, a master tailor and " the Armani " of Jamaica spurred his creative drive, The years assisting in his father's tailoring shop, provided Orville with the background of experience and skills he would draw on later as he build his own design business in Canada. Subsequent years of education and training in Architecture, mechanical drafting and computer aided design honed his design acumen and multi-dimensional vision. Leaving a well paying position in electromechanical draughting, Orville gambled on his talent and expertise, launching himself a full time fashion design career. 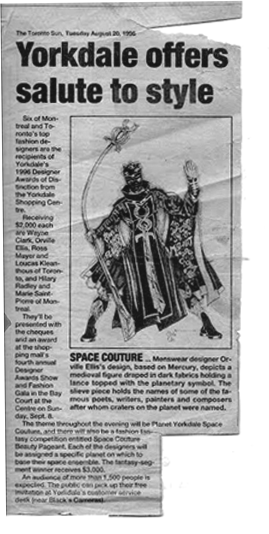 He began in 1986 by opening his first retail outlet - " Bo-Villos's men's boutique " at 86 Mc. Caul Street in Toronto's Village by the Grange. 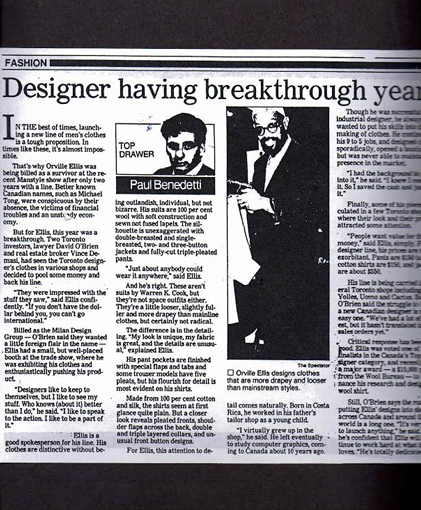 The highly individual and unique nature of his design collections brought immediate recognition as an innovative and talented new Canadian designer. 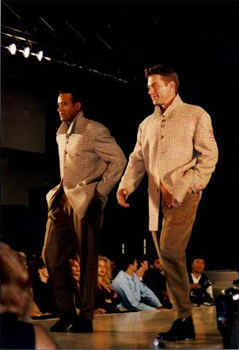 In 1990, under the Wool Bureau of Canada's new Woolmark Designer Foundation,Orville Ellis won financial and resource assistance to research fabrics for a new line of lightweight wool shirts as part of his fall / winter collection.